Clinton? Nope. Trump? I'll pass. 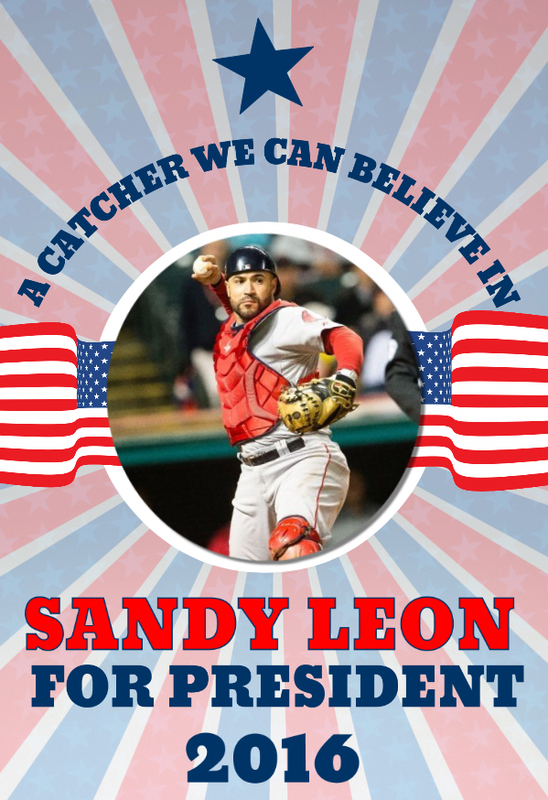 Sandy Leon for president? YOU BETTER BELIEVE IT!!! Qualifications: Leon is a natural leader and actually gets it done (something most politicians can't say about themselves). This season, he has 2 homers, 13 RBI, and 11 doubles to go along with an outstanding slash line (.458/.500/.712) in just 20 games. In addition, Sandy commands the pitching staff which is no easy task. He is also widely respected as a solid defensive catcher across the league. Before I get started, let's clear one thing up. I'm not just hopping on the Leon bandwagon now. I am the one driving it. 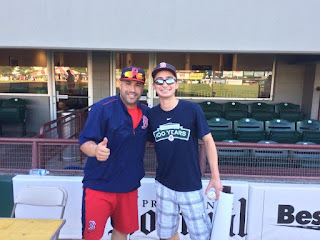 We've been boys since last year when I met him in Triple-A. I told him he was my favorite player. He laughed. It was a bonding moment. 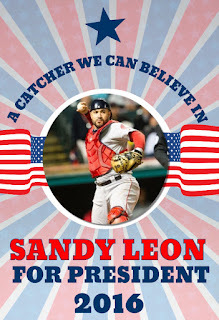 My campaign for Sandy Leon to become the 45th President of the United States began last night after yet another Sox win. Sandy had another typical day at the office going 2-4 with a home run and 4 RBI. Next, I needed to spread the word. Leon can't do anything for this country if he isn't voted into office. So I took to Twitter to release my campaign poster. There was one small issue though: I don't have a huge Twitter following (for some reason). Fortunately, I know someone who does. Sandy is obviously too humble to brag about himself, but Jared Carrabis of Barstool Sports will never pass up an opportunity to hype up a Sox player. I tweeted the poster to Jared and he quickly gave it the retweet. Next thing I know, plenty of people are aware that Leon needs to become the next president of this great country. The magic of Twitter! Quick plug (not that he needs it): follow @Jared_Carrabis on Twitter and read his posts on Barstool if you don't already. It's a must for any Sox fan. As long as Leon keep mashing the baseball, his support will only continue to grow. The sweet swinging Sandy Leon shows no signs of slowing down so that should not be an issue, but there is one huge problem that can totally ruin my plan. Leon was born in Venezuela, not in the United States. To be eligible for office, you need to be born in the states. However, this is SANDY LEON we are talking about. There's a first time for everything. If an exception was ever going to be made, it would be for future President Leon. Worst comes to worst? He becomes VP. Thoughts on the future president?